First off, I want to give a huge thank you for all the thoughts and prayers yesterday, you ladies are so amazing. I have met so many wonderful, thoughtful, strong and kind women through the blogging community that sometimes I don't know what I would do without all of you. Your sweet texts and messages yesterday really put a smile on my face so thank you again! I wrote this post while on the plane back from Charleston otherwise I still might not be ready to post today but I'll hopefully be back fully tomorrow. Tribal print has been done a million times before but I love that it's still such a popular print right now and seems to be going strong for fall as well! I love everything from the colors to the different patterns and how versatile it is. You have so many different options for wearing it which is why it was pretty funny when myself, Biana and Amanda all got dressed one day during our Charleston trip all wearing a different version of tribal print. I wore a strapless tribal print maxi that you probably remember seeing on Zelle a few weeks ago. I absolutely fell in love with that maxi so I ran out to get it, especially after seeing the price point. I knew it would be perfect for walking around Charleston and versatile enough to be worn out to dinner or drinks sometime. The material is lightweight enough where it wasn't too hot (especially since I wore this on our hottest day in Charleston and the day we did the most walking) and it's super comfy. 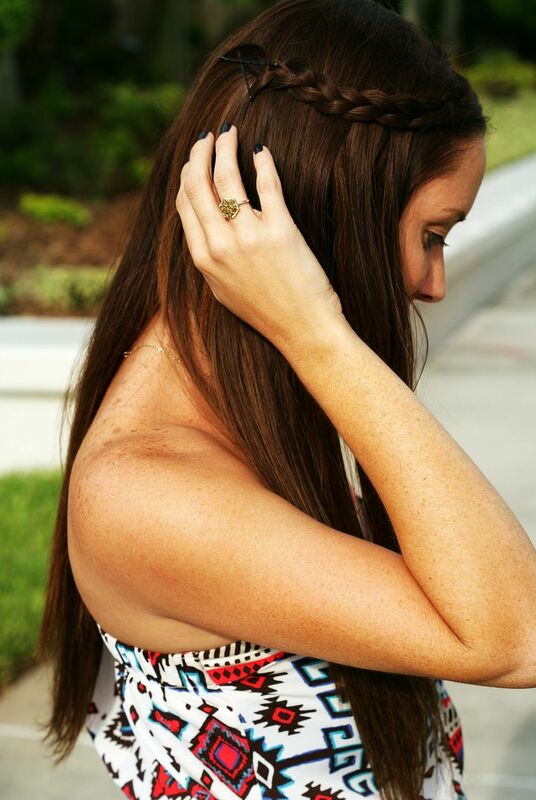 Be sure to heave over to B's blog and check out how she rocked the tribal print while we were in Charleston! Dying over that maxi! Glad to know that it's going to be in for Fall too, I need to do some Fall shopping STAT. You look beautiful in this dress! That first picture is gorgeous! That dress is so beautiful. Hope you are feeling better today! You look gorgeous in that dress and i LOVE the braid! ok i want this maxi. i think i could even pull it off :) hehe. love how y'all matched (unintentionally) :)so cute! This dress is way too cute! The print is so fun and your hair looks amazing! Love this entire look! The maxi, the braid - so cute! These dresses are the #1 thing I will miss about summer fashion, they're just the most comfortable things to wear! Maxis are great for Charleston weather when you need something loose and airy. I love these pics! Hellooooo, perfect maxi dress! I LOVE that print! Your hair is rockin' here too, babe! Love this gorgeous dress on you! And the longer hair is so much fun!! I love the side braid! 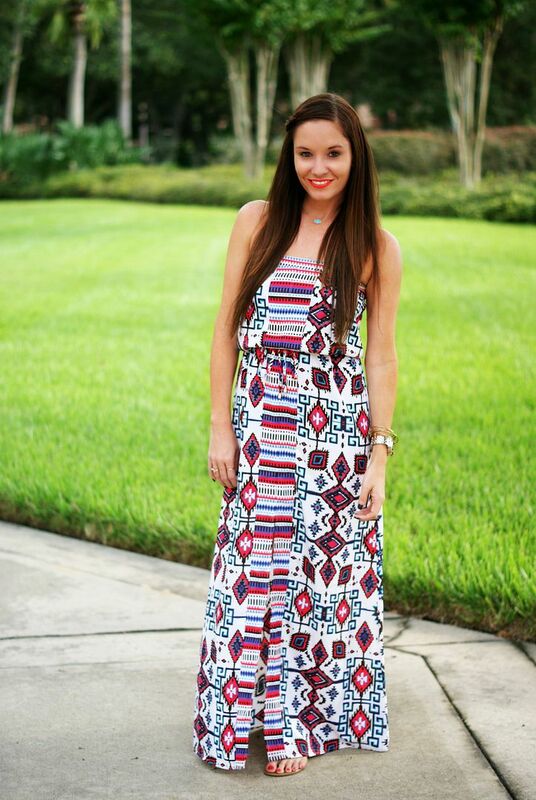 A fun print maxi is always the perfect summer look! You have the best hair!! That whole look is beautiful on you, love a good maxi especially in a pretty print! Love love love this and, as always, it looks amazing on you!! I hope you're feeling better! Take care girl! You can never go wrong with a good tribal print! This dress is awesome!! Just beautiful, and another Target find?! They can do no wrong this year. That third to last photo of the bottom straight on needs to go Pinterest viral like NOW. You are so stinkin' gorgeous! This dress looks great on you. Love the hair, too! You definitely rocked out this dress & the side braid! Love it! I know this is a fashion post but I'm loving your HAIR in it!!! Love love love this on you! And hair = on point! This look is just fabulous on you! I love it all!!! The scenery in the background, the print on the dress, the style of your hair....summer perfection!! I hope you are doing ok girlie, sending hugs!!! What a great summer dress! A good outfit sometimes has the power to turn your mood around. Hope you are doing better today! These photos came out amazing! Beautiful dress and your hair looks fab! This dress is perfect! I'm a huge fan of tribal print, and I love the colors of this one and the silhouette of the dress! This dress looks amazing on you! And I so love how you styled that first photo on the staircase. Love this dress! Gorgeous, lady! Awesome print! And I think your braided hair style goes along so nicely with the dress. It looks like the perfect outfit for Charleston. oh, that is such a pretty print!! !